After two days of milder weather temperature and wind conditions are again worsening over the next few days. The fear is that the multiple fires through the Blue Mountains could link up to form a mega conflagration imperiling all the mountain communities that nest along the Great Western Highway. The fire could funnel down the Grose Valley joining the Springwood fire and crossing the Hawkesbury River to threaten the Richmond and Penrith districts of Western Sydney. The Premier of NSW Barry O'Farrell on Sunday declared a 30 day State of Emergency which will give additional powers to emergency personnel in ordering evacuations and combatting the bushfires. An indefinite total fire ban has also been declared for Sydney, Hunter, Illawarra/Shoalhaven & Central Ranges. We've seen fires that big but as I said this morning, you've got to go back decades and decades before you see any fires of this parallel and what I mean by that is the sorts of damage, destruction, loss and devastation, that we've witnessed in the last 48 hours is typically aligned to what you would see in December or January. I don't recall... any parallel and even then you can't draw a true parallel, you've got to go back to '68 fires where you've got anything of an equivalent order. What is fundamentally different today to all those decades past is there is a hell of a lot more people settled across these at risk areas than there was back in the 50s or 60s... so it is in my view unchartered territory, we are dealing with unparalleled conditions which is why we're taking this extremely seriously. The Mayor of the Blue Mountains City Council Mark Greenhill says the region is looking at a difficult few days ahead. The fire has now jumped the ridge at Mount Victoria and is now burning in the Grose Valley. The Grose valley could funnel the fire to Springwood and the Hawkesbury with a fire front from east to west across the Blue Mountains. For the city of Blue Mountains, our big concern over the next few days is the fire near Springwood and Winmalee which is sitting in the valley and every time the wind blows it comes out and is a danger to homes. The other concern is the State Mine fire, which at the moment is sitting to the north-west of us. If that fire gets into the Gross Valley and it is already spotting in that area, and comes down the Gross Valley and jumps the highway at Falconbridge we have a problem with the whole city. We have predictions of wind speeds increasing from 50km/h through to Wednesday it may be 100km/h. We have a significantly difficult couple of days ahead. difficult couple of days ahead. On Monday morning there were 56 fires burning, 12 uncontained. 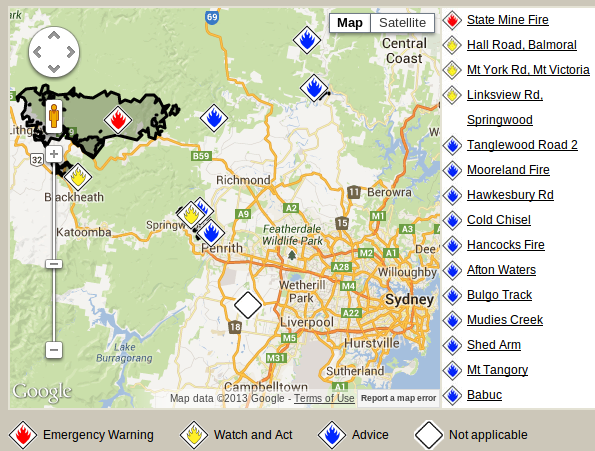 The Lithgow State Mine Fire, with a 300km perimeter, is still at the top emergency warning level. The NSW Rural Fire Service is focusing on the Blue Mountains, with concerns the Lithgow and Mt Victoria blazes could merge, according to Jessica Dietrich from Seven News (@jessdietrich7). In these extraordinary times we have our Prime Minister Tony Abbott working a 14 hour shift over Saturday night helping back-burn around Bilpin in New South Wales. He volunteers with the Davidson Rural Fire Service who were part of the Warringah-Pittwater strike team. This is really playing politics with the bushfires, distracting from the work of the NSW Rural Fire Service containing the fires, and also drawing the Prime Minister, his security detail and any media into dangerous situations. We don't need a Prime Minister using the bushfire to raise his macho self-esteem. Rather, he needs to lead the Federal Government on disaster assistance and Federal support to NSW and institute policies that reduce the long term risk factors associated with bushfires. That certainly does mean dealing with climate change through multiple mechanisms including putting a price on carbon. pic.twitter.com/0pfYGjNivu #PrimeMinister#TonyAbbott #Australia #Volunteer #RFS #RuralFireService #BushFires #NSW Tony HELPING!! #TonyRocks! In September the Barry O'Farrell NSW State Liberal Government reduced funding for the State's Fire Services. A by-election for the seat of Miranda on Saturday in which Firies handed out how to vote cards asking people to put the Liberals last resulted in a 27 per cent swing to Labor, setting a new post-war record for 2 party preferred swings. Of course multiple issues were involved, such as the change in public transport services and timetables, reduced funding to TAFE, and the fire station closures at a time when fire risks are increasing driven by climate change factors, new development and land use changes. Significantly, the O'Farrell Government also made deep cuts to staff and funding to two in-house Government teams focused on investigating and preparing for the effects of climate change and climate adaptation. According to a report in the Sydney Morning Herald by Peter Hannam, NSW's former chief scientist Dr Peter Smith said that both these teams had been slashed from 10 staff to 3 staff. "There's been more than a 50 per cent cut in the numbers of staff whose primary focus was climate change," Dr Smith said in his first media comments since leaving the role. "The [Office of Environment and Heritage] was being downgraded anyway from a super department under the previous government to being an office attached to the premier's [department]. The reduction in the climate change [section] was even more significant than the general reduction." 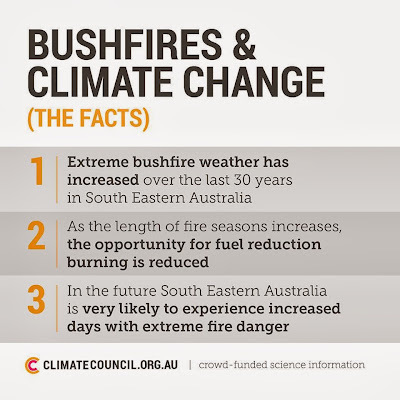 According to research that Dr Smith has participated in, the climate trends indicate that the Blue Mountains and Central Coast regions of NSW could expect to have a 20 per cent to 84 per cent increase in days with potential large fire ignition risk by 2050. 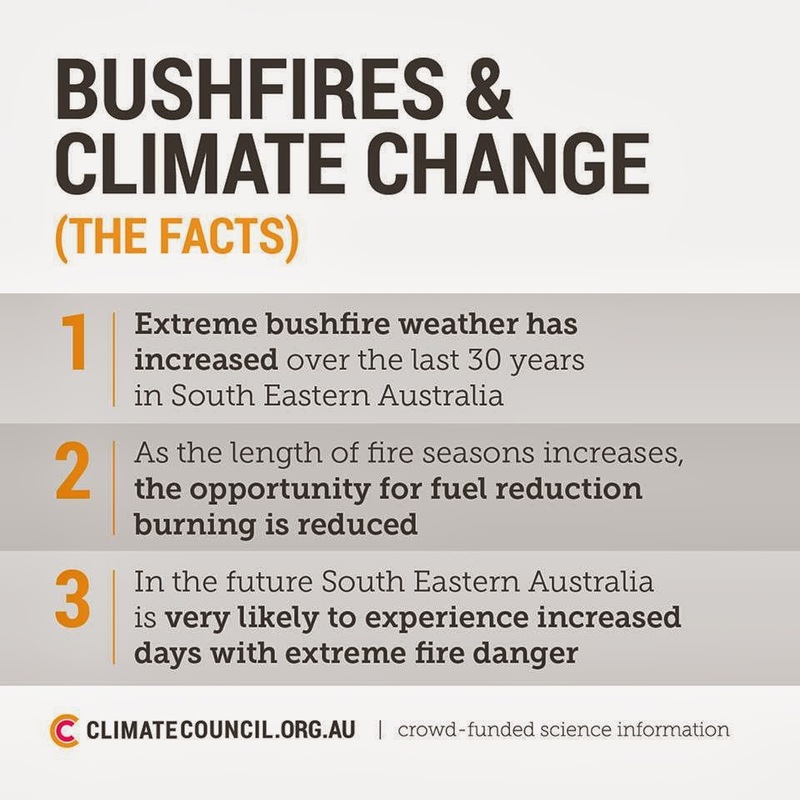 The number of days when the Forest Fire Danger Index is most extreme is likely to triple across south eastern Australia. Dr Smith accused Governments, both Federal and State, of adopting easy actions such as addressing energy efficiency while the difficult decisions on substantial cuts to carbon emissions and climate adaptation measures were deferred. "When you really see governments are going to take climate change seriously is when you see them spending money on adaptation," Dr Smith told Peter Hannam.